Like places worldwide, a Seattle Ferry Terminal walkway has become a place for lovestruck couples to mark their romance. A ritual for lovers is dying in Paris but surviving in Seattle. As French authorities embark on a massive effort to restore the Pont des Arts by removing the thousands of padlocks weighing on the sides of the pedestrian bridge, couples here are supporting a local version of the long-standing tradition by “locking their love” on a walkway that connects the Seattle Ferry Terminal with downtown. More than 250 padlocks of all colors and sizes engraved with anniversary dates and lovers’ initials are affixed to the chain-link fence that borders the pedestrian bridge along Marion Street, catching the eyes of ferry goers and photo-hungry tourists with their cameras and smartphones in hand. 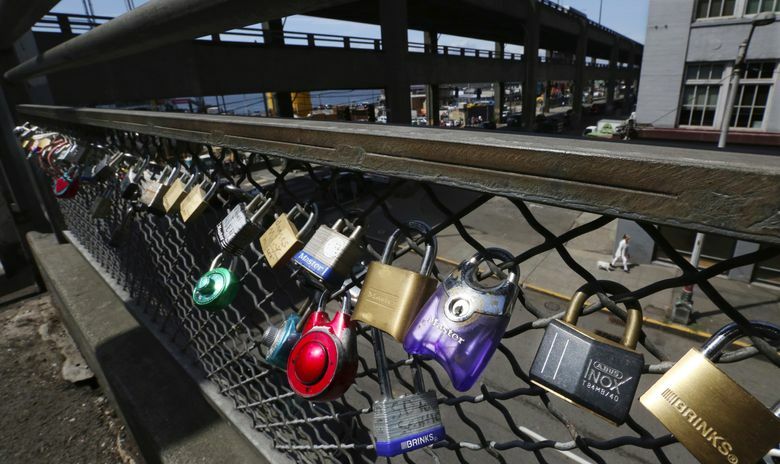 “It’s a symbol of significance because it [locks] our love in Seattle,” resident Nick Peinecke said. For decades, romantics like Peinecke all over the world have been attaching padlocks with personal messages of affection to fences, poles, gates and bridges as representations of their eternal romance. But like Paris’ rendition of the tradition, the symbols of amour may not be as ironclad as the love-struck couples may want to believe. Authorities worldwide, oftentimes with a much less sentimental view of the practice, work to remove the locks that can pose a safety hazard or nuisance. Debbie Peysar, co-founder of a love-lock distribution business based in Utah, said the centuries-old tradition likely started in China, more recently gained momentum in places like Europe and only within the last decade expanded widely to cities across the U.S.
She said her company, Lovelocks, which also works with local agencies to find structures that people can put their locks on legally, has seen tremendous growth recently, specifically since Paris officials announced in spring they would remove the 45 tons of locks affixed to the famed bridge. “They’re popping up as fast as they’re going down,” Peysar said. Peinecke said he felt the next chapter of his life begin the moment nearly three years ago when he clicked his lock onto a Seattle fence. He married his girlfriend of 17 years just hours before, and like couples nearly 5,000 miles away at the Seine River, they threw the key over the bridge’s balcony to represent their new, infinite commitment to each other. “It’s forever — that’s what marriage should be,” Peinecke said. Seattle’s Department of Transportation typically removes the padlocks whenever residents raise issue with the display. It does not have a record of when they first appeared or how often they’re taken down. Lindsay Cary, a friend of the Peineckes, said she first noticed the locks popping up next to the bar she tends, The Forge Lounge, about three years ago. She initiated the newlyweds’ love-locking ceremony as part of their wedding reception at her pub. According to the Peineckes, their lock is one of the hundreds still on the railing today.